Coastal Bend College “Student & Faculty Art Exhibition,” Opening Reception and Gallery Talk will be held on Nov. 30, 10:30 a.m. – 1:30 p.m. in the Simon Michael Art Gallery of the Frank Jostes Visual Arts Building. The gallery show closes on Dec. 7. Students will be on the gallery floor to discuss their work and a Student Art Sale is set for the same day, 9 a.m.-3 p.m.
Coastal Bend College’s Simon Michael Art Gallery, located in the Frank Jostes Visual Arts Building on the main campus in Beeville, will exhibit the work of a variety of artists and media. The 2011-2012 gallery schedule follows. Oct. 19 — Gallery Opening: “CBC Art Alumni Invitational,” Reception and Gallery Talk, 10:30 a.m.-1:30 p.m., Simon Michael Art Gallery, Frank Jostes Visual Arts Building. Closes Nov. 17. Nov. 30 — Student Art Sale, 9 a.m.-3 p.m., Frank Jostes Visual Arts Building. Feb. 22 — Gallery Opening: “CBC Visual Arts Division High School Art Competition,” Reception and Gallery Talk, 10:30 a.m.-1:30 p.m., Simon Michael Art Gallery, Frank Jostes Visual Arts Building. Closes March 11. March 21 — Gallery Opening: “Wissinger & Wissinger” Reception and Gallery Talk, 10:30 a.m.-1:30 p.m., Simon Michael Art Gallery, Frank Jostes Visual Arts Building. Closes March 23. Sept. 15 – 16, 2011, 9 a.m.-4 p.m.
Oct. 25-28, 2011, 9 a.m.-4 p.m.
Feb. 8, 2012, 9 a.m.-3 p.m.
Feb. 20-23, 2012, 9 a.m.-4 p.m.
All workshops will be held in the Frank Jostes Visual Arts Building. (unless otherwise noted). For more information, please contact Jayne Duryea, (361) 354-2322 or duryeaj@coastalbend.edu. Download the 2010-2011 visual arts schedule brochure here. The visual arts gallery season begins on Sept. 8 with the opening of Coastal Bend College Visual Arts Faculty. The Simon Michael Art Gallery is located in the Frank Visual Arts Building. Featured artists include Claudia Contero, Jayne Duryea, Bob Gomez, Luis Pena, Jan Shipman, Linda Swickheimer and Fulden Wissinger. The exhibit opens with a reception at 10:30 a.m. It is open to the public and many of the artists will be on hand to talk about their work. A gallery talk follows at 1:30 p.m. CBC art students and guests will get the opportunity to talk to artists about media, inspiration, process and other topics. The Simon Michael Art Gallery is open during college operating hours, Monday through Friday. The show will close on Oct. 14. A full list of gallery events follows. Oct. 20 — Gallery Opening: “Norman Wallace” Reception: 10:30 a.m. – noon, Simon Michael Art Gallery. Gallery talk: 1:30 p.m., Frank Jostes Visual Bldg. Closes Nov. 11. Dec. 1 — Gallery Opening: “Student & Faculty Art Exhibition,” Reception: 10:30 a.m. – noon, Simon Michael Art Gallery, Frank Jostes Visual Arts Bldg. Student art sale: 9 a.m. – 3 p.m., Frank Jostes Visual Arts Bldg. Closes Dec. 19. Jan. 19 — Gallery Opening: “Lynn Rushton “Forces of Nature”, Reception: 10:30 a.m. – noon, Simon Michael Art Gallery. 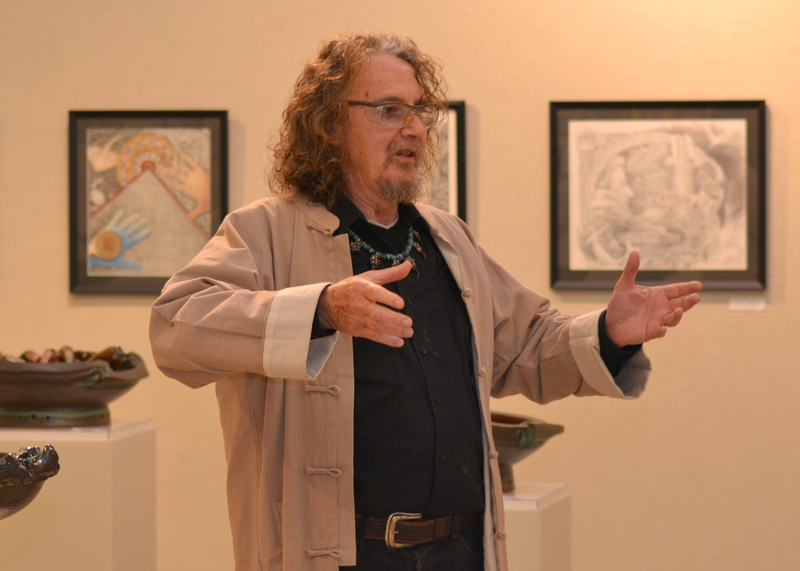 Gallery talk: 1:30 p.m., Frank Jostes Visual Arts Bldg. Closes Feb. 17. Feb. 23 — “CBC Visual Arts Division High School Art Competition” Simon Michael Art Gallery, Frank Jostes Visual Arts Bldg. Closes March 10. March 23 — Gallery Opening: “Larry Harrison, CBC Alumni” Reception: 10:30 a.m. – noon, Simon Michael Art Gallery. Gallery talk: 1:30 p.m., Frank Jostes Visual Arts Bldg. Closes April 21. April 27 — Gallery Opening: “Student & Faculty Art Exhibition,” Reception: 10:30 a.m. – noon, Simon Michael Art Gallery, Frank Jostes Visual Arts Bldg. Student art sale: 9 a.m. – 3 p.m., Frank Jostes Visual Arts Bldg. Closes May 5.